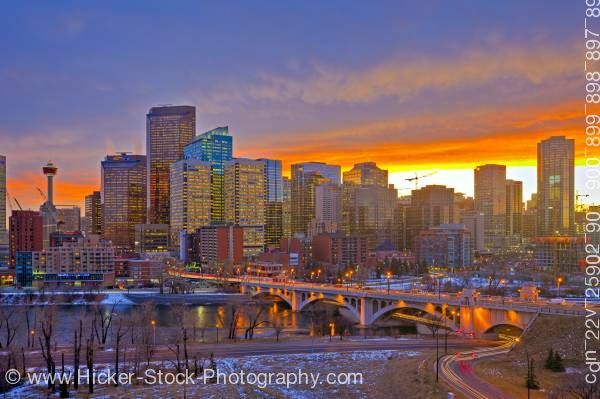 Stock photo of the Calgary skyline with the Calgary Tower and Centre Street Bridge along the Bow River at sunset after a light snowfall in the City of Calgary, Alberta, Canada. This stock photo includes the Calgary skyline with the Calgary Tower and Centre Street Bridge, along the Bow River after a light snowfall in the City of Calgary, Alberta, Canada. The lower clouds are bright orange in this pretty sunset scene overlooking the city. Calgary is the largest city in the Province of Alberta, Canada. It is located in the south of the province, in an area of foothills and high plains, approximately 80 km (50 mi) east of the front ranges of the Canadian Rockies. Calgary is well-known as a destination for winter sports and eco-tourism with a number of major mountain resorts near the city and metropolitan area.